With Spring well and truly on it's way, it's time to start dusting off your barbecues and get these drumsticks on them! This is a perfect recipe for spring. 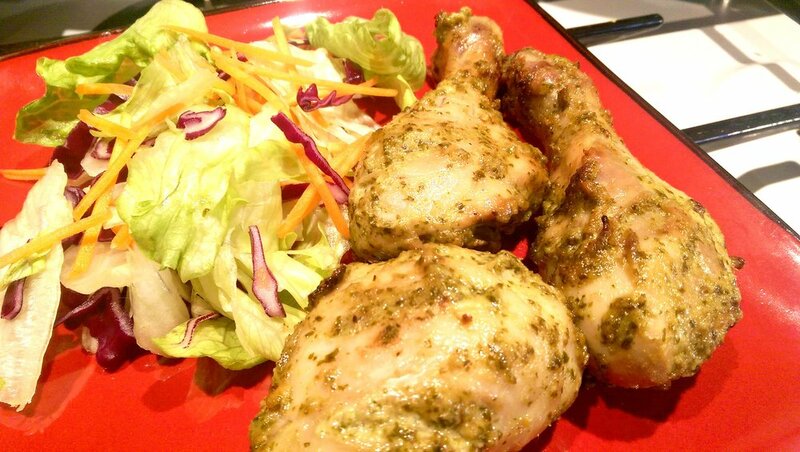 The tasty marinade works particularly well for the whole family. It's light and beautifully green so it really reminds me of everything to do with spring - lawn growing, fresh flowers and green leaves. Serve with a side salad for a light, healthy meal or chips if you want slightly heavier. This recipe suits everyone from a toddler (1 year and up) through to parents. It's tasty, quick and saves you the hassle of cooking separate meals so everyone can enjoy the same meal. With the Easter holidays still underway this is a fab holiday recipe. Serves family of 4. Total preparation and cooking time: 1 hour 40mins. Place the marinade ingredients into a blender and blend to a smooth paste. Then cover the drumsti cks with the marinade and rub well. It's important to score the chicken to make sure the flavour gets into the meat as well, not just the skin - or the inside will taste bland. Once the chicken is covered, leave to marinate for a minimum of 1 hour. But ideally leave them for as long as possible. Then cook in a pre-heated oven (190C/ 375F/ gas mark 5) for 35-40 minutes (turning over half way) until the juices run clear and the skin is nicely crisp. Or if the weather allows, pop them them on the barbecue until tender. Serve with a crisp side salad and sweet chilli dip. Alternatively serve with chips or egg fried rice. Note: If you have a toddler, blend the marinade without the salt and and marinate 1 or 2 drumsticks for your LO. Then add salt to the remaining marinade and marinate the chicken for the rest of the family. Tip: Add some fire to these drumsticks by adding green chillies to the adults marinade. It will taste amazing, but will blow your head! Just make sure you take out a couple of drumsticks for your LO before you add them in. You can find more delicious weaning and family recipes in Easy Indian SuperMeals for Babies, Toddlers and the Family available to buy now from Amazon. Prima Baby Awards 2015 - Silver Winner! Best family cookbook.